Tuberculosis (TB) is one of the most important causes of mortality in developing countries. India is one of the countries coming under the 22 countries of high TB burden list. TB of the optic nerve head manifests as papillitis, neuroretinitis, and optic nerve head tubercle. Isolated optic disc TB should be considered in patients who have lived/traveled to an endemic area, who are clinically asymptomatic and have the symptoms of papillitis. Visual recovery is usually excellent if diagnosed early and treated. Early diagnosis and treatment are the most important goal to prevent ocular complication and to avoid the side effect of nonspecific therapies. A 19-year-old female came with complaints of defective vision in the left eye (LE) for 20 days. The visual loss was insidious in onset, not associated with pain, watering, redness, headache, or photophobia. She was apparently normal before 20 days. She had no other systemic symptoms. No significant history, personal history, and family history were present. General examination, systemic examination, and vitals were found to be normal. Ocular examination showed a visual acuity of 6/6 in the right eye and 2/60 with no improvement in the LE. Anterior segment examination of both eyes was found to be normal. Both pupils were reacting to direct and consensual light reflex. 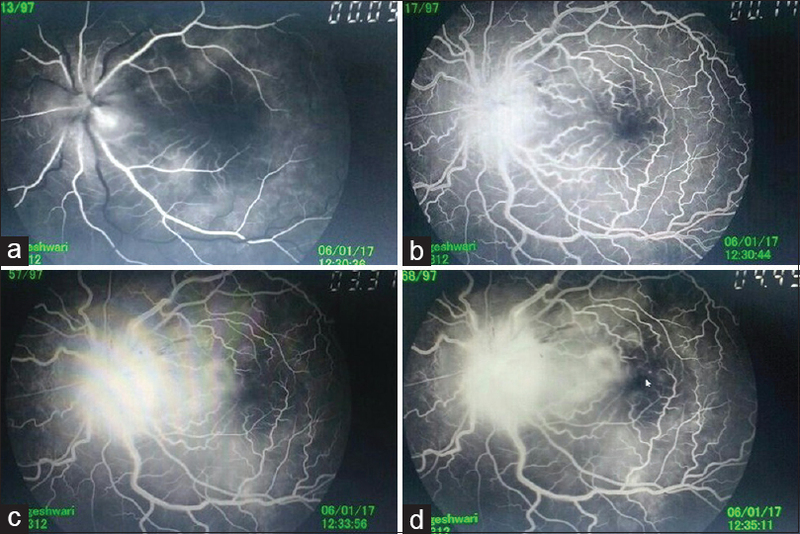 Fundus examination of the LE showed active papillitis and macular edema which was significant of acute phase of ocular TB [Figure 1]. 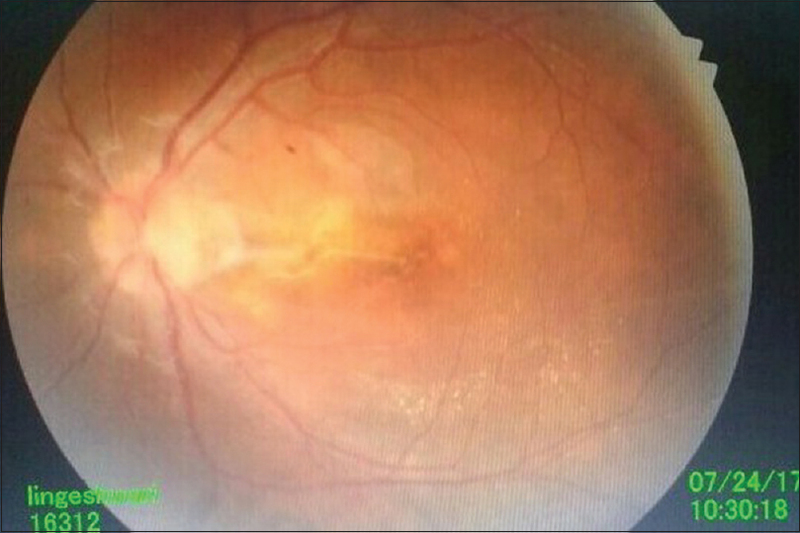 Fundus fluorescein angiogram findings showed optic nerve hyperfluorescence with leakage. Early hyperflourescence with leakage around the margins and macular edema was noted [Figure 2]. B-scan examination of LE showed a raised lesion over the optic nerve head with moderate echoes. MRI brain was normal. Systemic workup was found to be normal. Mantoux was highly positive showing an induration of 19 mm. QuantiFERON TB-GOLD test was positive. ESR was raised. Chest X-ray was normal. Screening for Toxoplasmosis, Other Agents, Rubella, Cytomegalovirus, and Herpes Simplex, Toxocara, Venereal Disease Research Laboratory, and Voluntary Counseling and Testing Center was negative. The patient was presumed to be a case of TB of optic nerve head based on Mantoux tuberculin skin test with 19 mm of induration and exclusion of other possible causes of uveitis and started on antituberculous therapy (ATT). Vision in LE improved to 6/18 and fundus showed resolving macular edema and reduction in disc edema at the end of 2 weeks of ATT [Figure 3]. The patient was started on tablet prednisolone after 2 weeks along with ATT and the dose tapered. The vision in LE improved to 6/9 at the end of 2 months [Figure 4]. Although TB remains latent in the majority of patients who are immunocompetent, a subset of those who are infected may develop pulmonary or extrapulmonary disease. The ocular manifestations may follow the pulmonary TB or may occur without evidence of pulmonary or other systemic signs. Roughly 60% of patients with extrapulmonary TB have no evidence of pulmonary involvement. Any ocular tissue may be affected including the ocular adnexa, conjunctiva, sclera, uveal tract, and the optic nerve. Ocular manifestations associated with TB are caused by an active infection or an immunologic reaction in the absence of any infectious agent. It is related to delayed hypersensitivity. The diagnosis of proven tuberculous uveitis is difficult to make because ocular sampling for microbiologic determination is not very effective. When performed aqueous and vitreous paracentesis have generally failed to show positive bacterial culture, therefore, most cases are presumed to be ocular TB based on skin testing and a good clinical response following specific therapy. Tuberculin skin test was the only test used for screening in latent TB infection. The Tuberculin skin test measures delayed hypersensitivity response to the purified protein derivative (PPD). A Mantoux test with intradermal injection of PPD must be done if ocular TB is suspected. Greater than 5 mm of induration noted 48–72 h later is a positive result in an HIV patient. Greater than 10 mm of induration is considered a positive result in high-risk individuals such as people living in endemic areas and health-care workers. Induration >15 mm is considered a positive result in apparently healthy persons. The mainstay of treatment includes antituberculous treatment for a period of 6 months. Systemic corticosteroids can be used in conjunction with ATT  and gradually tapered to prevent damage to ocular tissues from the inflammatory response. However, corticosteroid treatment alone can cause further progression of the infection and therefore should not be used without concomitant ATT. Isolated optic nerve head TB, similar to isolated choroidal or ciliary body TB, can be the presenting form of TB in immunocompetent  participants without extraocular clinical signs or symptoms. TB should be considered in the differential diagnosis of papillitis, even in asymptomatic patients, especially in this part of the world where TB is endemic. Mansour AM, Tabbara KF, Tabbarah Z. Isolated optic disc tuberculosis. 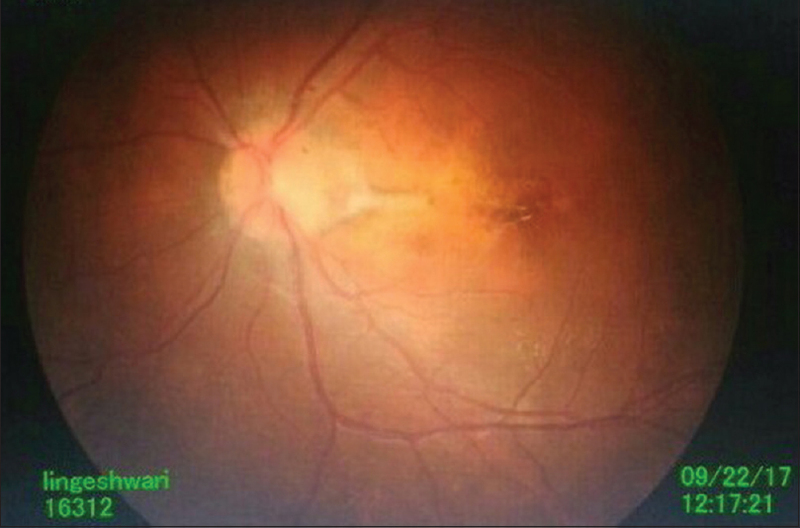 Case Rep Ophthalmol 2015;6:317-20. Gupta V, Gupta A, Rao NA. Intraocular tuberculosis – An update. Surv Ophthalmol 2007;52:561-87. Norazizah MA, Wan Hazabbah WH, Rohaizan Y, Shatriah I. Isolated optic neuritis secondary to presumed tuberculosis in an immunocompetent child. Med J Malaysia 2012;67:102-4. Buonomini AR, Ceccarelli L, Dori L, Cerulli A, Ricci F, Sarmati L,et al. Monolateral ocular tuberculosis in an immunocompetent patient: A case report. RIF 2010;1:110-4. Raghibi A, Hitam WHW, Noor RAM, Embong Z. Optic perineuritis secondary to tuberculosis: A rare case presentation. Asian Pacific J Trop Biomed 2012;2(Suppl 2); S1206-S1208. [Doi: 10.1016/S2221-1691(12) 60385-2].